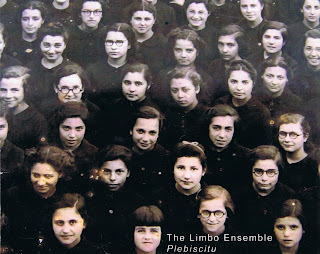 The album comes in a strange rectangular format, with working class girls from bygone days, all with their similarity yet different stories, staring at you, with sympathy, somehow capturing the essence of the music. The music is strange too, edited improvised music by nine musicians from around the world in a suite of chamber music, over which Paolo Chagas, the editor, plays his instruments : sopranino clarinet, flutes, field recordings, bass clarinet, short waves, electronics, soprano saxophone and oboe. The other musicians are Karl Waugh on violin, Quincas Moreira on cello, Bruno Duplant on doublebass, Massimo Magee on trumpet, Thomas Olsson on electric guitar, Travis Johnson on cello, Paulo Duarte on electric guitar, and Fernando Simões on trombone and objects. You hear at most five musicians at the same time, and even then the result is absolutely minimal, with bits of sound carefully sprinkled around to create something new, something surprising, something refreshing, something gripping. Paolo Chagas uses the musical vision of Ukrainian composer Thomas von Hartmann (1885-1956), a contemporary of Schoenberg, Kandinsky and Nijinsky, who wrote in his essay "On Anarchy in Music": "While the inner voice does not revolt, everything is permitted. In all the arts, especially music, any method born from an inner need is correct." It is equally no surprise that elements of classical music (violin, cello) as present as jazz (bass, trombone, trumpet) and modern music (eletronics, field recordings), or even with rock elements coming from the strange dry guitar sounds of Paulo Duarte. The careful selection and manipulation, the crafty re-orchestration of improvised pieces by Chagas results in a very coherent sound: human and emotional as the result of the improvisation, fragile and finished because of the editing. It does require open ears at moments, but the Limbo Ensemble offers a fascinating and surprising listening experience. You can also download the album and donate what you want. Be generous, this music has value.